Posted in: 6 The Movie Corner. Tagged: Angeli Bayani, Anthony Chen, Cannes Film Festival, Golden Horse Award, Iloilo the Movie. There will be a special screening tonight before the commercial run by December 4. This movie will make you cry. That much I can say. 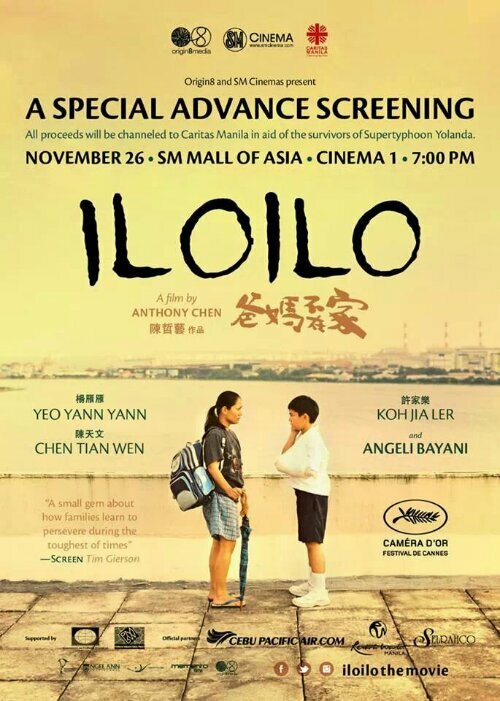 Iloilo the Movie took part in this year’s Cannes Film Festival and walked away with the Camera D’Or Prize for Best First Feature Film. It also won several awards (including Best New Director and Best Supporting Actress) in the recently-concluded Golden Horse Awards for Chinese-language movies. Catch a special screening tonight at SM Mall of Asia. If you can’t make it, watch out for the commercial run starting December 4. You will be proud of the performance of Angeli Bayani. And you will be more touched that she plays the true-to-life role of a Filipina nanny (Teresa Sajunia) who raised the film’s director (Anthony Chen) just like her own. ← Where on Earth is Crimea? Ang ganda ng preview, tumulo pati uhog ko sa kakaiyak. So you must be in Singapore, Sheena, as you seem to know a lot about the film and its director. The preview looks very touching and I’m sure that it’s a very good one considering its international awards and citations. However, I don’t go to cinemas and pay for a ticket to feel bad. It’s just me. Hi Dex…I’m sure there will be scenes that will make you feel bad in the movie, but I guess the inspirations that the movie brings can more than compensate for whatever sadness it evokes. My point is, those inspiring moments in the film… and those creative depiction and delivery of the characters’ pathos, ethos & logos should not be missed. Just my take. Thanks, Benjie. All your points are genuinely valid but it is those heartbreaking scenes that make me feel SO bad. Honestly, I used to watch such outstanding films before but nowadays I watch to laugh like a Joker or get amazingly thrilled. The last film I saw was Thor: The Dark Side in 3D at MOA. Thanks again. I’d say this is best Singaporean movie that I’ve seen so far. Deserving of all the nominations and awards.